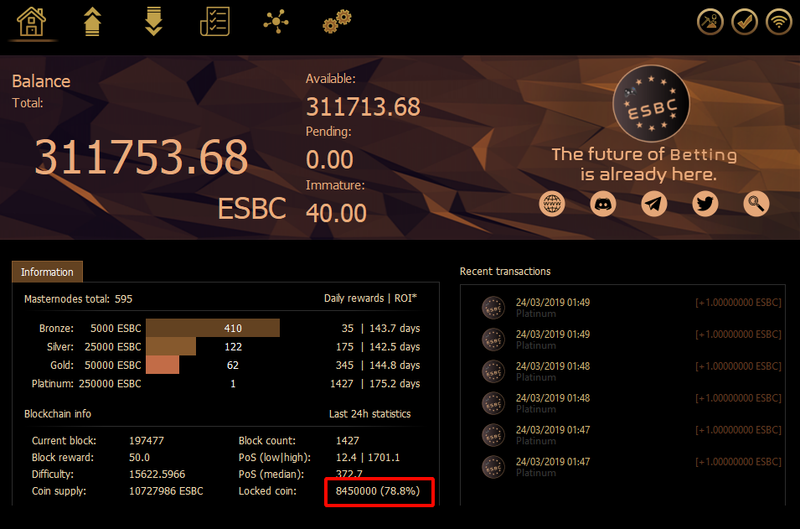 Update of the ESBC Blockchain. We recently launched the first Platinum Masternode and it doesn’t look very attractive, since the rewards for it are only 2% of the block reward. In spite of this, the overall situation has changed for the better, since the number of coins used for masternotes has increased from 69.5% to 78.5%, this is a very important indicator in the masternode community. This article will tell you what changes will occur in with the rewards, after the mandatory update of the ESBC Blockchain. 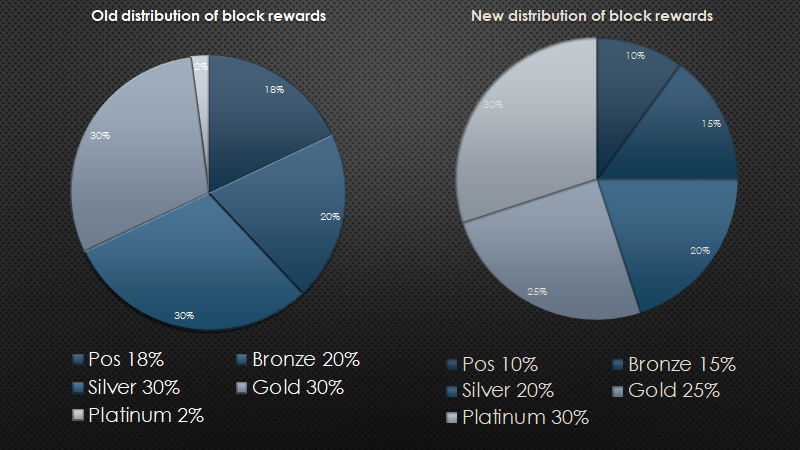 The increase in the number of blocked coins is possible by reducing the reward for PoS, at the moment the reward for PoS is 18%.It is impossible to reach the figure of blocked coins to the level of 90% with such a high reward for PoS. Also from recent events, you should be aware that a big reward for PoS can have bad consequences. Activation of the new protocol — April 8, 2019 18:00 UTC. With the activation of the protocol, it becomes possible, if necessary, to enable/disable the commission for the development of the project (dev.fee), up to a maximum of 10% of the reward unit. All planed expences from developers side you will find in the Budget article. All PoS and masternode awards, with an active commission will be reduced by this amount in proportion. With the activation of the protocol, the recommended / minimum transaction fees increase, the possibility of sending small transactions free of charge, up to 1000 bytes, remains. The minimum quantity for staking becomes 10 coins. Users and services that have more than 5 Gold levels will launch Platinum. Starting only 3–4 Platinum levels immediately makes the activation of the Gold level profitable, and the participants who used the Silver level for their coins (usually the most profitable one) will replace 2 of their Silver with the Gold level. For services that still use Bronze, it will be convenient to upgrade to the Silver level, in order to increase their own rewards and save resources, we are ready to provide them with a guaranteed amount for the instant node, if necessary. Thus, the entire distribution system will be built from scratch. After the first increase in block time, ROI will decline when it reaches 120 seconds in 6 weeks, the release of new ones will be halved, which should favorably affect the price of ESBC. You just need to download and use the new version of the wallet. It will be available on GitHub, we will definitely announce this and you will have about 2 weeks to update. - Avoiding generation of blocks on the basis of pos, on a model with a variable block timing and blocks on demand, based on the masternode network. We are glad to hear your opinion, leave your feedback on our work, suggestions and questions.